The average passenger vehicle weighs approximately 5,000 lbs. A semi-truck can legally carry loads 16 times that weight. Think of a moment when you had a difficult time stopping your vehicle. Perhaps there was low visibility due to fog or rain. Maybe some unexpected ice on the road. It’s possible you were even distracted in some way, trying to avoid an accident at the last possible second. As much damage as a car collision would have caused, think about how many times it would be multiplied if a big truck collision was involved. You simply can’t prepare for such an event—even if you’re a safe driver, you could still be the victim of a devastating incident. Tire blowouts, shifting cargo, and driver fatigue are some of the most common reasons for tractor-trailer crashes. In 2015, over 415,000 crashes were reported involving a large truck, and 20 percent of them resulted in injuries. Such totals are on the rise, as fatal crashes from large truck accidents increased 6% from 2010’s totals. 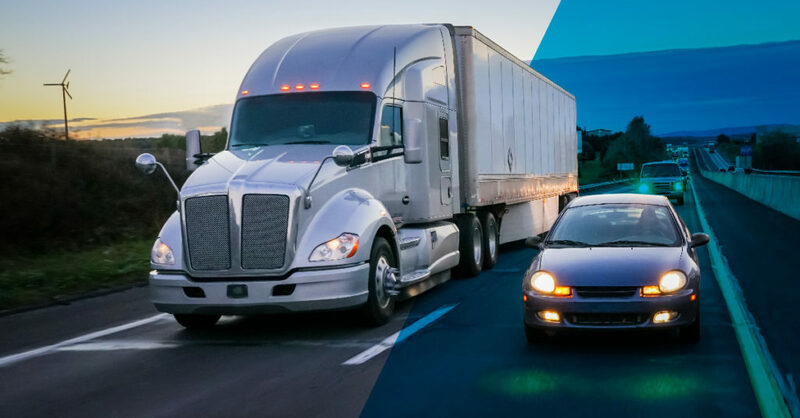 Given the sheer size and weight of these vehicles, the severity of any injuries and the extent of resulting property damage is much greater than in your typical car crash. This is why having someone on your side who understands the differences and complexities is crucial for making sure you’re properly taken care of in the event of a trucking collision. With years of experience handling large truck collisions, our dedicated legal team at Johnson Jensen is familiar with the multiple rules and regulations in place at the federal and state levels. We’re also committed to walking with you step-by-step through your recovery as trusted professionals who will keep your best interests in mind through the entire process. Large truck collision cases will hinge on being able to prove driver negligence, which means that the driver was not as careful as he or she should have been. It’s important for your legal team to be very familiar with the federal and state regulations for the trucking industry – including things such as driver log books, hour limits, licenses and cargo inspections – as they are the rules in your potential case. You can be sure that the trucking companies and their legal teams know these rules and have their own investigators already at work on the case. If you’ve been injured in a large truck collision, Johnson Jensen is ready to start helping you right now — by listening carefully, advising you thoughtfully, working diligently, and walking with you step-by-step through your recovery. Call us with your questions or schedule a free consultation at 317-269-7799.